I love SSH. It's the most convenient and secure way to manage multiple machines over the internet. It allows me to access my desk machine or my home server from anywhere in the world. It calms my paranoid side with features like SSH Tunneling. In short, SSH is one of my favorite tools. But the Internet is an interesting place. 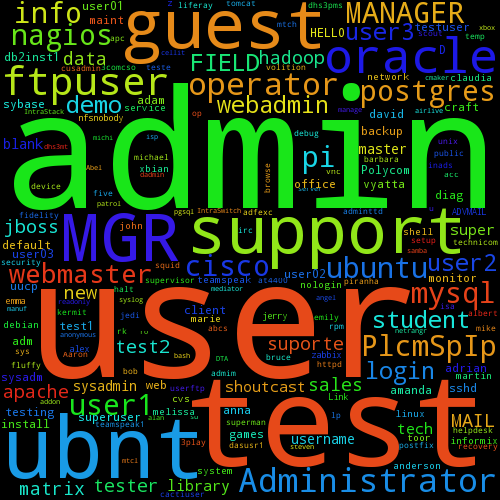 As predicted, admin was quite popular, along with user and test. I thought the most interesting username was ubnt, which must be the default admin username of Ubiquiti Networks' AirOS. The moral of this story: It's probably best to restrict SSH access to a small set of users; and if your only user is admin with the password password, then you probably deserve to get hacked.